" Start Jumpin With Jump5 "
This is a picture of what the cover is going to look like!!!! | disneymania 2 - 01.27.04 | Don't forget to pick up a copy of DisneyMania2 on January 27! This sequel to September 2002's CD will feature Jump5's "Welcome" from Brother Bear, as well as Stevie Brock sining "Zip-A-Dee-Doo-Dah," Raven's "True to Your Heart," Jesse McCartney's "Second Star to the Right," Hilary and Haylie Duff covering Lady and the Tramp's "We Are Siamese," and a bunch more!!! And you can stop by their official site at disney-mania.com! | we'll miss you, libby!!! | In September at the Indianapolis Zoo, Libby asked us jokingly, "Don't y'all ever get tired of us?" We trust her decision and respect her. We also trust that we will love the new member, but nobody will ever replace Libby as an inspiration and role model to Jump8. We'll miss you, Libby!!! some more audition info | Just wanted to let everyone know some things about auditions. This week Jump5 has been holding two sets of auditions in search of a new fifth member. Tuesday night was the first night, and I've heard that went well. But if they can't find what they're looking for in this first round, a second round of auditions will take place. If you are interested and have the time/money/talent to be taken seriously, email LyndaveMusic@aol.com with your name, age, vocal level, dance level, and telephone number. Good luck to Jump"4" in finding a successful new addition!!!
" 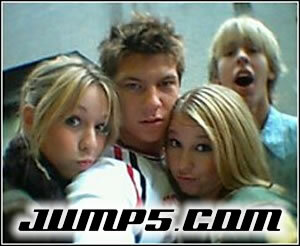 Angel's 'n' My heart "
Jump5's Music is heard everywhere , from Radio Disney to Lizzie Mcguire !!!! ~*~*~ Their song shinging star is on the Lizzie Mcguire movie !!! ~*~*~ You hear their music on secular 'n' Christian radio. ~*~*~* They r feaured on mix cd's , such as the NEW " WOW Hits 2004 "
~*~*~* Just listen 'n' watch , Jump5 is everywhere , these days!!!! ~* Some contributed by different News sections , of different Jump5 Websites. Hey guys what a year huh? Its been a lot of fun. Brittany and I had a great time celebrating Christmas with our family. It was really special. There were a lot of relatives that came to visit us. Guess what? I ended up getting the coolest gadget under the tree. A phone that can take videos! Its screen is like 10 times bigger than my sisters picture phone, so its kinda funny that now I have the coolest phone in Jump5! A few days later my mom ended up losing her phone and got the same one I have. Its like playing with the two most awesome walkie talkies ever. I also got the Indiana Jones DVD set, the Adobe Video Collection which I plan to use in making some home videos. Who knows, maybe the time is right for the sequel to Crazy Monkey Mullets? As youd probably expect, I also got some Xbox games. The one Ive been playing a lot of is Dance Dance Revolution. Its a lot of fun to the play it in Multiplayer mode with Xbox live. If you play it a lot online, you might have danced against me. As for the present I hinted at last month - Brittany and I got our parents a Tivo system. I dont know how our family ever lived without it! After seeing it in action even my grandma was convinced that she should get one! After a short little break were back to school. Having Christmas off was very special to us. I had the best time with my relatives, and as usual, the Honey Baked Ham, Potatoes and Pumpkin Pie were amazing! I cant forget to mention that I got a new Digital Camera and an iPod. I spent the next three days loading all my CDs on my computer so I could put them on my iPod. Its really cool. This week we had school and afterwards Ive been working out. Haha, dont think Im going to get huge or anything. Its something I need to do to stay fit for our performances. Youd be amazed how much stamina it takes to make it through a show. DO YA the fun pop single from the Jump5 October release, Accelerate, will be featured tonight on CBS Series Drama, JAG. DO YA the fun pop single from the Jump5 October release, Accelerate, will be featured tonight on CBS Series Drama, JAG. Tonight's episode, titled Girls Best Friend, airs at 9pm ET/8pm Central and will feature the Jump5 single as background music during a scene where Matie and Officer Coates are enjoying a girl's night out and listening to the song, DO YA, on the radio. JAG is an adventure drama which follows the missions and legal dealings of Commander Harmon (David James Elliott), a daring Navy officer and lawyer, who works together with the JAG team as they investigate, defend and prosecute military-related cases from their home base near Washington, D.C. 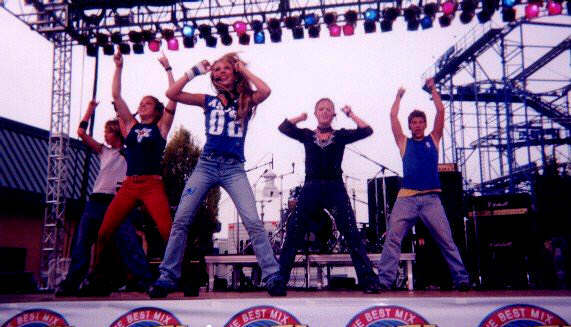 In the four years since their official formation, Jump5, has been building momentum, acquiring a touring audience of more than 1 million while traveling with Aaron Carter, A*Teens and Baha Men. Jump5 has garnered significant exposure on their own, with performances at the White House, CBS Early Show and ABC Christmas Morning with Regis and Kelly, Nickelodeon and Disney Channel. Jump5 also recently completed a very successful first headlining tour this Christmas in 14 cities. Special message from Libby of Jump5. Hey everybody! .....this is so incredibly hard to do. But I want all you guys to know. I have decided to step out of Jump5. I can't tell you what a hard decision this has been. The hardest of my short life. There's no juicy gossip to have. We are all still really good friends and they have been nothing but SOOOO sweet to me. We are still supporting each other 100%. It's simply that I want to take a deep breath and see what exactly God wants me to do at this point in my life. This has not been a quick or easy decision but I have prayed about it for a long time. I'm actually going back to my old High School at home! You should have seen me the first day (yesterday)...nervous like a Kindergartener. Then today, Chris showed up and gave me a hug. Whoa! Is he great or what? You all have been so supportive and loved me in so many ways. My greatest and MOST memorable moments were when I was able to talk to you all one on one about having Jesus in your life on stage. My promise to you is that I will continue to pray for you daily. And I pray you will remember how important it is to have Jesus in your heart!!! I can't wait to see who God brings as a new member to Jump5. I know they'll be awesome and you'll welcome them with open arms. Hey! I'm going to sign up for the web site and be a fan...just like you! I know that Jump5 will succeed because I truly believe God WILL be in it. Again, I thank you from the bottom of my heart for supporting me, praying for me and just being there. God has blessed me beyond belief. I always was and now I am more than ever... just a regular kid. P.S. I'm gonna play soccer. I don't even know all the rules! Special message from the members of Jump5. Hey Guys, we need to share some news with you about the changes in Jump5. Libby has decided to leave the group. She has just decided that this isn't the right time for her any longer and feels she needs to be at home and have a normal schedule. She wants to go to regular school and play sports! We totally understand where she is coming from, you know, wanting to be home with friends and family all the time and we support her FULLY in this decision and wish her only the best in whatever the future holds. We hope that YOU GUYS will also support her and keep her in YOUR prayers. We do want you to know that we are sticking together and with your support, I know we can make it through!! That's all the news we can give you now, but we will keep you informed of anything NEW as soon as possible. Thanks for your support. We hope to see you soon! Good luck Libby...we love you! For anyone who wants to show Libby their support by sending her an email, or writing her a letter, you can do so at libby@jump5.com. Libby would love to hear from you. I had so much fun, most importantly I got to be with my family and go to my grandparents and aunts houses. My parents gave me a camera, and I also received some clothes and a voice recorder for my iPod. For New Years Eve, we had a really interesting show at Disneyland. Just after the first song the speakers blew. They were able to move us to another stage, but unfortunately we werent able to use our headset microphones. It ended up being one of those rare shows with us performing with handheld microphones. Since we have some time off, I decided to stay out in California. Yesterday I went with a bunch of friends to Six Flags Magic Mountain. It was soooo much fun. The highlight of the day was the Dive Devil. Its a 150 free fall. I was calm, but the person I went with was a little freaked out, which actually got me a little nervous. It was so cool though. Lesley Moore is NOT sick w/ mono , anymore!!!!! This is a pic of Brandon , Chris , Brittany , and Lesley being crazy!!!!LOL!!!!! Brittany , You go gurl!!!! Pic of Brittany Hargest (and others ) , singing their heart out to God!!!! Jump5 getting their groove on!!!!! !